Interestingly though, one of the biggest and most consistent debates across the conference was that of technological advancement vs the importance of human engagement for consumers. 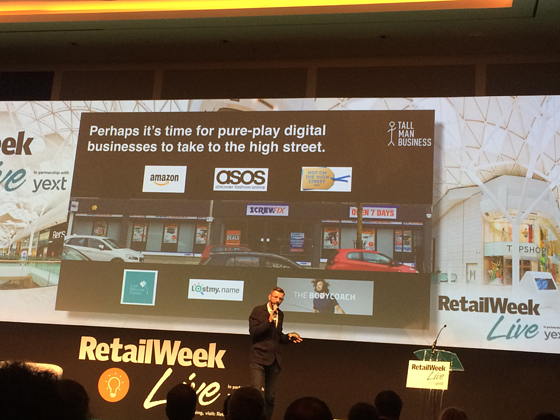 Alex Baldock, CEO of Shop Direct gave a fantastic presentation which made the case for ‘pure play retailing’ – a bit too compelling given I’d be out of a job if everyone did jump on the bandwagon. He talked about how at Shop Direct they have started using AI to replicate human-style responses to customer queries. This means they can create efficiencies of scale whilst still giving the consumer the feeling of human engagement, which across RWL it was unanimously agreed was key regardless of progress in technology. Simon Devonshire, the government’s entrepreneur in residence, argued that perhaps pure-play retailers needed to take more of an interest in the high street. Indeed, the co-founder of Birchbox talked about their move into physical store space and plans to open more stores over the coming year. The Director of Retail & Customer Experience for Thomas Cook stated that over 50% of their customers still buy in store. As a millennial, I find it difficult to imagine an instance where I might have to physically go into a travel agent. However, Kathryn Darbandi argued that their in-store customer base was incredibly broad, routinely serving everyone from university students to an older demographic through their physical store portfolio. The relevance of physical space was further reiterated in a presentation given by Jill McDonald, CEO of Halfords and my new hero (articulate, amusing and clearly well thought through ideas which were engagingly presented). Jill talked about how “changing the size and shape of the Halfords portfolio is not at the top of the to-do list, the size and geographic reach of the portfolio being a competitive advantage”. Currently, they estimate that everyone is living within a 20-minute drive time of a Halfords store. Online is beginning to play more of a part in the business but even with 12% of the sales now coming from the website, 85% of these are still click and collect. Jill also stressed the importance of service and convenience, putting their people at the very heart of their strategy with a relentless focus on training for in-store teams. This was echoed by John Timpson, chairman of Timpson. John gave a wonderful talk about their policy of ‘upside down management’. At Timpson the power sits with their in-store teams and they recruit solely on personality and not skill-set. As John said, “you can teach someone the skills they need but there’s not much you can do with a grumpy cobbler!”. Congratulations also to John Timpson for winning the lifetime achievement award at the evening awards dinner. Convenience was also a key theme and widely discussed around the conference in different guises. Whilst for example, McKinsey argued that we were hugely over-spaced in Grocery, the symbol group operators seemed to take a different view. This was again reinforced by John Timpson who discussed their strategy of partnering with the big four grocers. He called this a real win-win, with their Timpson service offer driving footfall into the bigger supermarkets by increasing convenience for customers. Really, truly knowing exactly what it was they were providing, why, and to whom. Whether that was Timpson and Halfords who have an utterly relentless focus on providing a service, or Birchbox who spoke about the very specific problem their service was designed to solve and why. The opportunity presented by developments in artificial intelligence, consumer tracking and virtual reality will be game-changing... but who really likes change if they’re honest? How can retailers harness technology to the benefit of their customers without negating the need for common sense and human contact? Where should a retailer even start on this journey? Which aspects of these new technologies will be relevant for their specific consumer base? Where does this journey end? There is still a role for the store in UK retailing. Whether you have a large, legacy portfolio or you are a pure-play retailer moving into physical space, there is absolutely a need for bricks and mortar. Stores and physical space are key to creating convenience and trust. Consumers will always want to be able to visit a store, have an experience and physical space plays a huge part in building brand advocacy. However, the role of the physical store space has changed significantly in recent years. Retailers need to really look at their portfolio and their customer base in tandem and ask themselves, what is the purpose of my portfolio? Speaking of stores – huge thanks go to Simon Devonshire (the government’s entrepreneur in residence) and Will Crumbie (CFO, Fat Face). Both of whom argued in their presentations that LDC’s data and insights were crucial to better understanding store behaviour, the role and relevance of a portfolio and risks and opportunities for any given brand across UK high streets, shopping centres and retail parks. Thank you both! It was a truly eye opening two days and as always, reignited my love of retail as an innovative, exciting space which, whilst facing challenging times, is in the midst of a fundamentally transformative period. Lucy Stainton is a Senior Relationship Manager at LDC who works predominantly with occupiers providing data and insight to enable them to make evidence-based decisions which deliver positive impacts on their business. To speak to Lucy about how she can support your business, email her at Lucy@localdatacompany.com.